This Victorian man with severe face and body deformities is still remembered today. Joseph Merrick is better known by his freak show name: The Elephant Man. Born on 5 August 1862 in Leicester, England, Joseph Carey Merrick was born without deformities. For the first few years he was the same as his brother and sister but by about the age of three small lumps and bumps started appearing on the left side of his body. The enlarged bony lump on his forehead grew and his enlarged lips made speech more challenging. As he grew, a noticeable difference between the size of his left and right arms appeared and both his feet became significantly enlarged. His mother, Mary Jane Merrick, died when he was 9 years old and his father, Joseph Rockley Merrick, remarried a year later in 1874 (to Emma Wood Antill). He left school at 13 years old and was told to find a job. He managed two years in a cigar rolling factory but the increasing clumsiness of his deformed his right hand made it impossible to continue. His father got him a pedlar’s licence so he could sell haberdashery door-to-door but, due to his shocking appearance, people wouldn’t open their doors. He wore a mask made of sacking to hide his face but he endured constant harassment from the local children and adults. At this point, he was told to leave by his father and stepmother. He lived with his uncle for a few years but was still unsuccessful as a hawker. 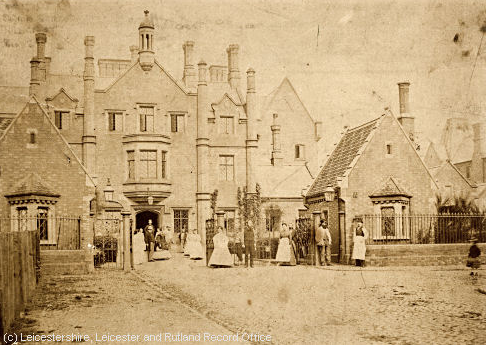 In 1879, when 17 years old, he ended up in the Leicester Union workhouse where he stayed for four years. Victorian workhouses were often more like prisons for the unemployed and unemployable. They worked long hours for the roof over their head doing the most unwanted laborious tasks of the era. We did have an operation on his face while staying at the workhouse as the protrusion from his mouth had grown to 8–9 inches and severely inhibited his speech and made it difficult to eat. Joseph’s deformities progressed until he could no longer perform manual tasks, and without working he could not stay at the workhouse. This was when he made the decision to write to an agent called Sam Torr to ask if he wanted to put him on display in a ‘freak show’. Joseph was taken on as a curiosity attraction called ‘The Elephant Man’ in August 1884. Torr advertised him as “Half-a-Man and Half-an-Elephant” and toured the East Midlands before the show came to London for the winter season. 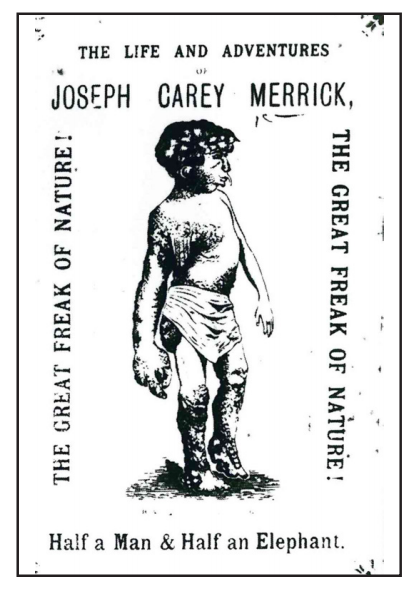 Money was made from customers wanting to see this ‘freak’ and from sales of Merrick’s autobiographical pamphlet. A showman called Tom Norman rented a ‘penny gaff’ (a place for cheap entertainment) at what is now 259 Whitechapel Road (was no. 123). He took Joseph on without seeing him and was initially concerned that his appearance may be too horrific for his paying customers. 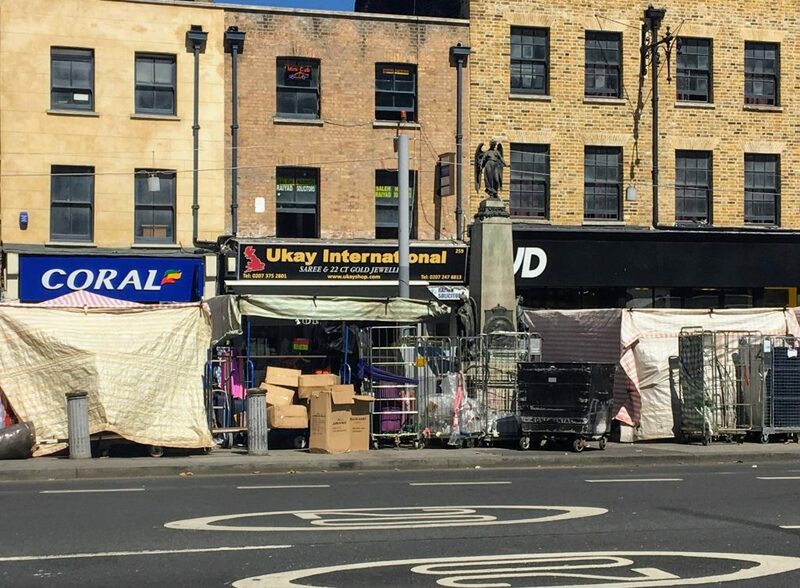 Now between a Coral betting shop and a JD sports shoes shop, 259 Whitechapel Road was the former curiosity shop where Joseph Merrick (The Elephant Man) was on display in 1884. 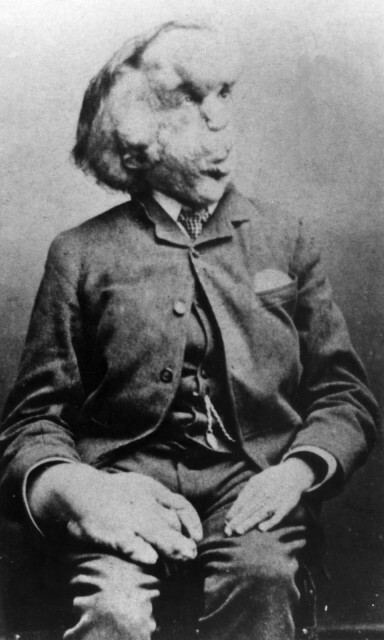 Ladies and gentlemen … I would like to introduce Mr Joseph Merrick, the Elephant Man. Before doing so I ask you please to prepare yourselves—Brace yourselves up to witness one who is probably the most remarkable human being ever to draw the breath of life. As the Travel Darkly site explains, “perhaps it was actually the doctor Sir Frederick Treves who was the real showman, as he was the one who told the Elephant Man’s incredible story, turning himself into a hero, Merrick into a victim and Norman into the monster”. As the curiosity shop was directly opposite the London Hospital, many medical students and doctors were interested in seeing this rare condition. This was where Joseph first came into contact with Dr. Frederick Treves – a man who would change his life forever. 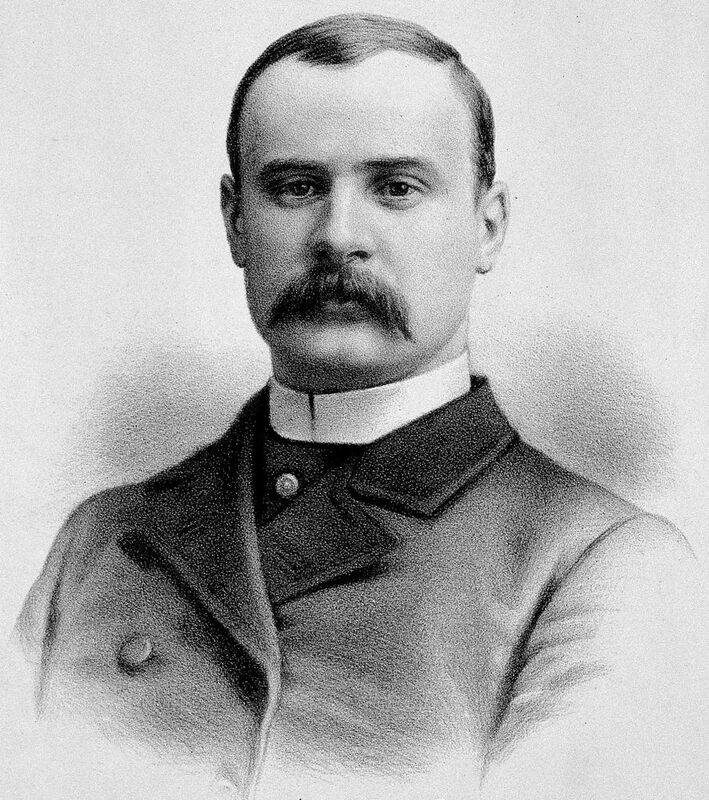 Frederick Treves had been a student at the London Hospital Medical College in the 1870s and was a rising star in the medical profession. He was alerted to see this unusual man on display and he gave Joseph his calling card when he visited for a private viewing. Dr. Treves first took Joseph to the London Hospital Medical College in 1884 as he was interested in learning more about his unusual condition. He measured Merrick’s head circumference at 36 inches (91 cm), his right wrist at 12 inches (30 cm) and one of his fingers at 5 inches (13 cm) in circumference. Joseph kept the doctor’s card and continued to work in freak shows. 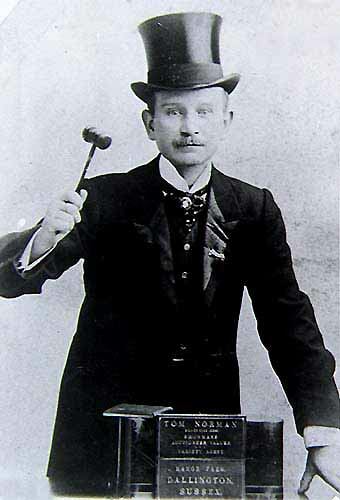 When human curiosity exhibits were outlawed in the United Kingdom in 1886 he travelled to Belgium for work. Here he was mistreated, had his savings stolen, and also contracted a severe bronchial infection further complicated by his deformities. He returned to London and ended up causing hysteria at Liverpool Street station when he arrived during the morning rush hour on 24 June 1886. When people saw his cloaked, masked and twisted body trying to walk crowds came to stare. 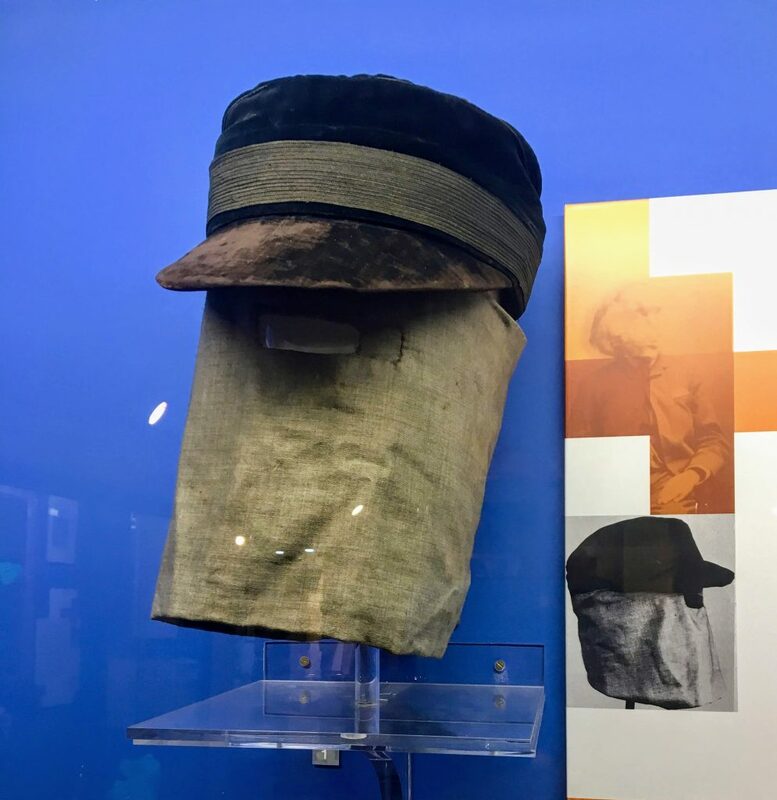 The hat and veil reputedly worn by Joseph Merrick (The Elephant Man) between 1884 and 1890. Now on display at the Royal London Hospital Museum. Joseph was so unwell with the bronchial infection that he struggled to speak so when he asked for help no-one could understand him. But he did still have Dr. Treves calling card so he showed that to the police and the doctor was summoned. He was then taken to London Hospital to be treated on Cotton Ward. Dr. Treves was able to help with the infection but his deformities were incurable. With such a short lifespan predicted, it was decided he could live the rest of his life at the London Hospital. The two men became close friends and there was public sympathy for Joseph’s plight. With the money raised, he was moved to his own rooms in the basement of the East Wing of the hospital. Due to his difficult to understand speech, it was first considered that Joseph was intellectually impaired. But it soon became clear that he was an intelligent and sensitive man. In his later years, he found some solace in writing poetry. Joseph grew in confidence and wanted to know about the “real world”. He asked Dr. Treves what a “real” home was like so the doctor took him to his house at 6 Wimpole Street, in central London, where Joseph met the doctor’s wife. Joseph had spent his life separated from women (in the workhouse and in the side shows) and was well aware of how his appearance frightened most women. Dr. Treves wanted Joseph to feel more ‘normal’ so arranged for his friend Mrs. Leila Maturin to visit Joseph. He often said she was the first woman to smile at him whereas other women had shown only revulsion. 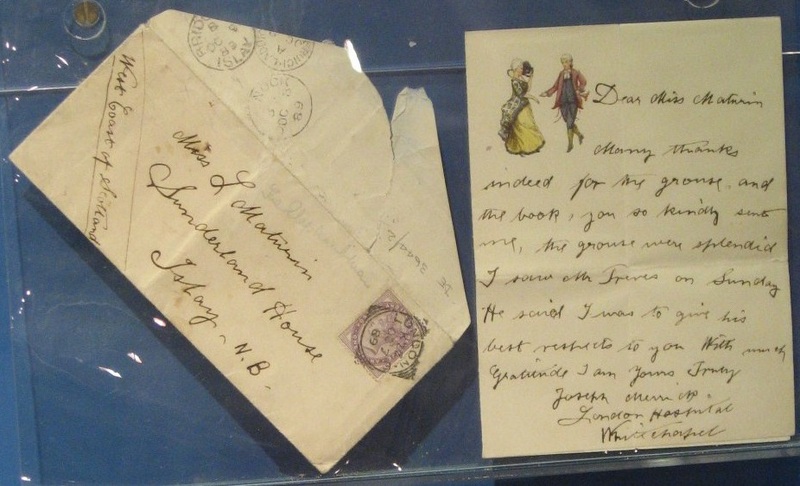 They stayed in touch and wrote to each other. 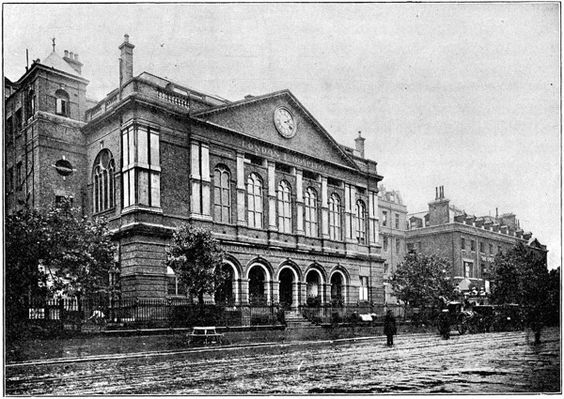 On 21 May 1887, the Prince and Princess of Wales came to the hospital to officially open two new buildings. The royal party met with Joseph in his room, and the Princess sent him a Christmas card each year. Princess Alexandra’s kindly interest led other members of the upper class to embrace him. He eventually became a favourite of Queen Victoria. 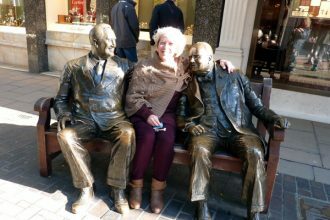 It’s unclear whether actress Madge Kendal did ever actually meet Joseph in person but she was able to raise public sympathy and therefore more funds to help support him. 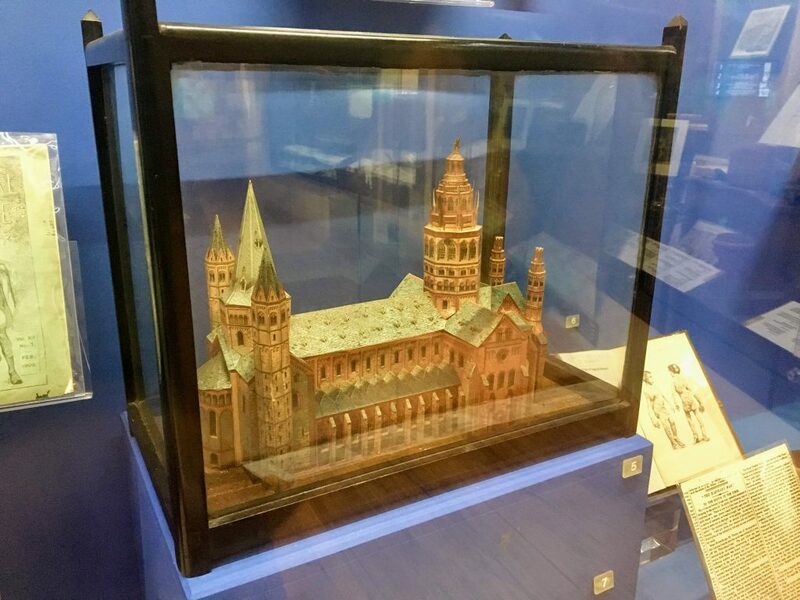 This model church, on display at the Royal London Hospital Museum, was given by Joseph Merrick to the actress Dame Madge Kendal (1849-1935). Model church made of pasted pre-printed card by Joseph Merrick (The Elephant Man) when resident at The London Hospital. Dated c.1886. The model is a kit of German manufacture and is likely to be of Mainz Cathedral. He often said to me that he wished he could lie down to sleep ‘like other people’ … he must, with some determination, have made the experiment … Thus it came about that his death was due to the desire that had dominated his life—the pathetic but hopeless desire to be ‘like other people’. Merrick himself was keen to help the Victorian doctors with their scientific investigation. His skeleton is kept in a private room at Queen Mary University of London’s medical school for medical students only. 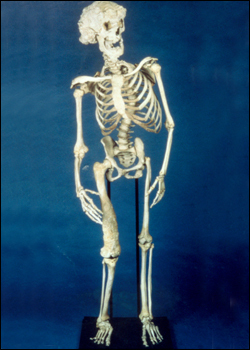 The skeleton of Joseph Merrick, ‘The Elephant Man’. 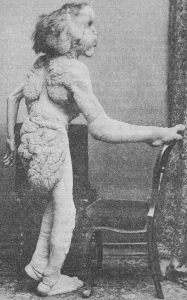 Joseph Merrick was originally thought to be suffering from elephantiasis. The Merrick family explained his symptoms as the result of his mother being knocked over and frightened by a fairground elephant while she was pregnant with him. Obviously, this explanation is complete nonsense. 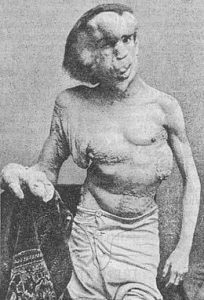 In 1971, Ashley Montagu suggested in his book The Elephant Man: A Study in Human Dignity that Merrick suffered from Neurofibromatosis Type I, a genetic disorder also known as von Recklinghausen’s disease. In July 2003, Dr. Charis Eng announced that as a result of DNA tests on samples of Merrick’s hair and bone, she had determined that Merrick certainly suffered Proteus syndrome, and may have had Neurofibromatosis Type I as well. While Joseph Merrick is better known as John Merrick, it is not his birth name. Sir Frederick Treves recalled the name as such in his memoirs. It is unclear if Treves recalled details incorrectly or if Joseph Merrick went by John. Michael Jackson reportedly tried to buy Merrick’s bones from the Royal London Hospital in 1987. He later ridiculed the idea and The Elephant Man featured in his 1989 Leave Me Alone video. 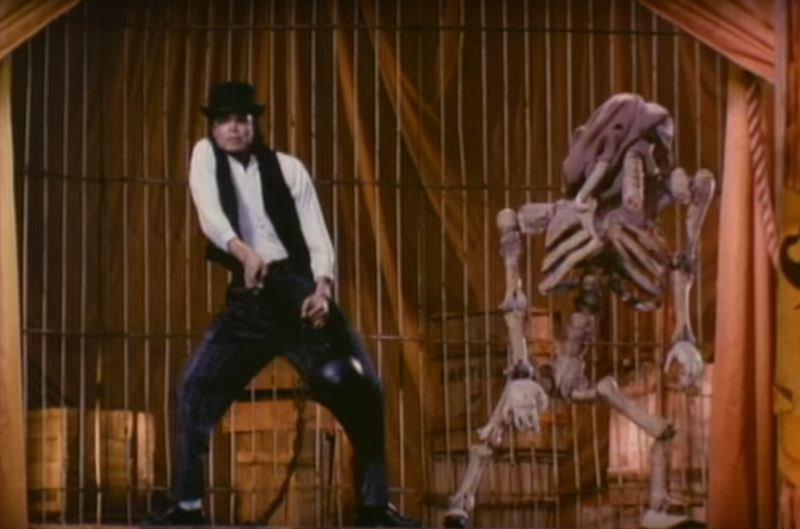 Scroll through to the side show section and you’ll find MJ dancing with the bones of an ‘elephant man’. A small museum exists on the hospital grounds in the former crypt of St Philip with St Augustine church (the church was completed in 1892 shortly after Joseph’s death). It holds a number of items related to Joseph – including his iconic cloak and hood and a full-size replica of his skeleton. 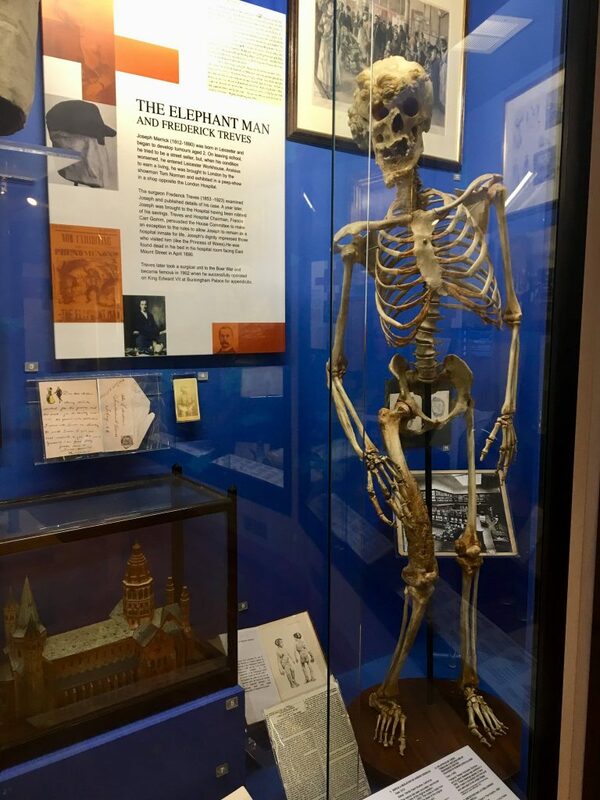 Visitors can watch a reflective documentary about ‘The Elephant Man’ detailing his life, death at the hospital and his friendship with his doctor. Also at the museum is a display about Jack the Ripper and associated forensic equipment and operating tools. There’s a display about WWI hero nurse Edith Cavell, who was executed in 1915 after helping up to 200 men evade capture, plus more about healthcare in the East End. 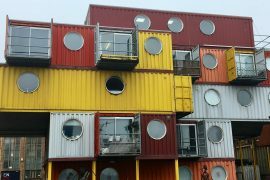 The museum is free to enter (although donations are appreciated).